He won the Tour Championship and that gave him confidence he could win again. Now he has confidence that he can win a major again. Watch out. He has a real shot at Jack right now. I still think it’s a long shot but he has Bethpage and Pebble coming up in the next few months. He could win either of those. I believe they said this win puts him to 6th ranked in the world. A #1 ranking and another major this year are all possible. This was a fun thread to read back through. He has a shot. Yes. 3 to tie. But If I had to bet on whether he would win 3 more majors, I would say no (which means he will, lol). He's so good at Augusta and his experience payed off today. They other thing was watching a staggering 4 players in contention choke on 12. Thats not to say Tiger didn't make his shots. He made the perfect, near perfect tee shot on 16. But if everyone else didn't choke on 12, who knows how it plays out. Basically, when he wins, he won't win running away like he used to. Which will narrow the likelihood of him winning more often. I think the PGA is a wide open tournament, not too tough, so anyones best guess who wins there. The U.S. Open is borderline unfair at times. Can Tiger rebound when he misses a five foot putt and it rolls 50 yards off the front of the green? He could maneuver around a British Open course with his 3 wood well since some guys leave the driver at home for that tournament. But advantage Euros over there. I will be very intrigued to see how he plays in the next three majors. All of which he will probably be the favorite in. But I do think it's more likely he ties Jack in Green Jackets (6, one more) than in majors (18, three more). 3 majors is a lot. Most great golfers struggle to win 1, so winning 3 won’t be easy. That being said, I think #15 was the toughest one to get. Now that he has finally gotten over that hump, it could get “easier” for him now. It’s interesting listening to the players talk about this. This younger generation is loaded with great players but they are all in awe of Tiger. They love the guy and he has embraced them as well. What I find interesting is a guy like Koepka, who is a beast out there, was basically happy to finish second to him. He wasn’t bummed out. I don’t think he carries the same level of intimidation he once did but you do wonder if some of these guys will get caught looking at him and have that distract them. Btw..he has won 23% of the events he has been in. That number was around 30% prior to all these injuries. Phil is at 7%. Incredible that he has won almost 1/4 of the events he has been in. Best thing for Tiger about yesterday, at least as far as it pertains to him winning another major, is that he didn't fold. Since he's come back, he's played very well and been in contention a few times, but unlike his past when he forced everyone else to melt, he's been the one to miss short putts or hit unforced bad shots during crunch time. Yesterday was vintage Tiger. He hit tons of great shots down the stretch and made nearly every difficult, crucial shot to avoid giving anything back. All that while his playing partners were crumbling, including a guy that we thought was a mistake-free machine who could be caught and passed but not likely to come backwards. He'll never have the physical advantages that he used to enjoy over his competition. Others are far better than him in terms of striking the ball particularly off the tee (he was exquisite with the irons this week, though). And many of them are equal to him in terms of short game and putting as well. But that mental advantage I think he might be able to regain, which I didn't think was the case before watching him do it again this weekend. And if he has that, then he's a threat if he can find himself in contention. Good for him. Didn't really like him before the fall, but it seems like he's learned some lessons and is a better man for it. Everyone loves a good redemption story. On a completely unrelated note, somehow I missed that bnickle got banned. 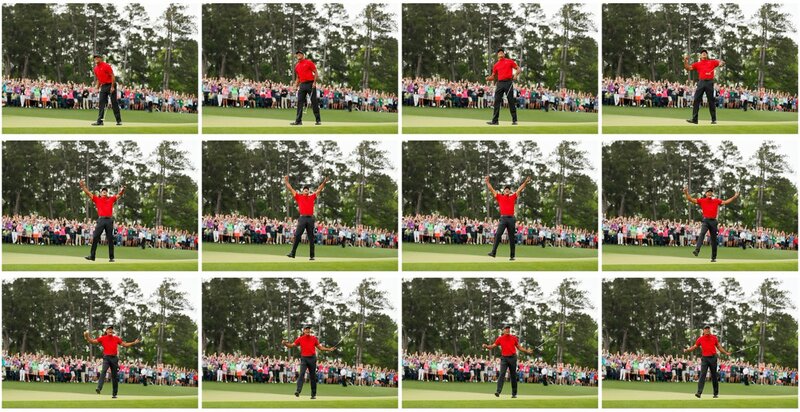 I think everyone on some level has felt that exuberance that Tiger shows in that series of photos that Nigel posted above. What a sense of accomplishment. A lot crow eating in this thread. Branden could feed off crow for a month. I had one post in this thread suggesting he was addicted to pain pills. Masters Sunday had the highest ratings in 34 years. That is even with it starting at 6am on the west coast. Nike’s valuation went up 4 billion dollars between Thursday and Monday. Have to think companies that dropped Tiger (Buick, Gillette, etc...) are regretting that.